Shiveluch (Kamchatka): Activity at the volcano remains elevated. The lava dome extrudes currently 2 lobes of viscous lava, a larger one on the NW side and a smaller one on the SE side, which seems to have appeared around 16 Feb. The active parts of the dome suffer frequent small to moderate-sized avalanches (mainly from the NW side). Bright glow can be seen at night. A larger collapse on 18 Feb caused a pyroclastic flow that reached a length of approx. 3 km and an ash plume that rose to 23,000 ft (7 km) altitude. Chirinkotan (Northern Kuriles): SVERT reported that a thermal anomaly over Chirinkotan was observed in satellite images on 12 and 15 February, and steam-and-gas emissions were observed on 16 February. Cloud cover obscured views on other days during 11-17 February. The Aviation Color Code remained at Yellow. Aso (Kyushu): JMA reported that a very small explosion from Asosan's Nakadake Crater occurred on 16 February and yesterday morning. In both cases, a steam plume with some ash rose 300 m above the crater rim and drifted S. The Alert Level remained at 2 (on a scale of 1-5). Sakurajima (Kyushu, Japan): Eruptions have been stronger again during the past days. In the 4 days since 16 Feb, at least 6 vulcanian-type explosions were recorded with ash plumes rising up to 12,000 ft (3.7 km) altitude. Suwanose-jima (Ryukyu Islands): An explosion occurred at the volcano yesterday, VAAC Tokyo reported. The height of the ash plume was unknown. Kelud (East Java): The volcano itself remains relatively calm and produces only a degassing plume. So far, no clear picture has been available about what exactly is going on at the crater itself (e.g. whether a new lava dome is forming). The biggest problem at the moment are lahars, mud flows that form when rain water mixes and remobilizes loose deposits. These mud flows can carry boulders of meter size and are extremely destructive (imagine flowing cement with mixed-in large debris of all sorts). It is estimated that approximately 50 million cubic meters of tephra deposits from the 13 Feb eruption could be remobilized by the rains in the coming days, weeks and months to come. Areas most at risk are river valleys and their river banks. The first lahars have already appeared during the past days, and produced extensive additional damage, but fortunately no fatalities. A bridge and 2 houses were swept away by lahars from the river Sombong. A mosque and several other houses were also destroyed in the district of Kediri. A person had to be rescued when trapped on an island surrounded by fresh mudflows. Dukono (Halmahera): New ash plumes were spotted this morning by VAAC Darwin on satellite imagery. Ash clouds at approx. 7,000 ft (2.1 km) altitude drifted 80 nautical miles to the east. 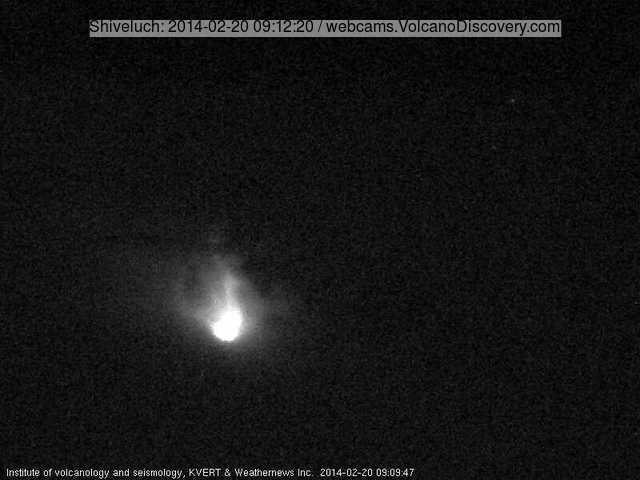 Probably strombolian activity seems to be relatively intense at the volcano. Kilauea (Hawai'i): (19 Feb) 43 earthquakes were strong enough to be located beneath Kilauea Volcano in the past 24 hours - 9 of them were on the south flank faults! The tiltmeter at Pu`u `O`o recorded the start of DI deflation tilt at 9 pm yesterday - around 14.5 hours after the summit DI deflation tilt! "Poas in Costa Rica is becoming active, there are reports on the local news. We feel lots of tremors and rotten egg gas is more common. Tungurahua (Ecuador): Overall, the volcano's visible activity has continued to decrease with fewer and weaker explosions, although seismic activity remains moderate to high. The strongest explosion in the past days was one yesterday evening that produced an ash column rising 3 km, a powerful cannon-shot explosion sound. Bombs fell around the crater at distances of 500 m.